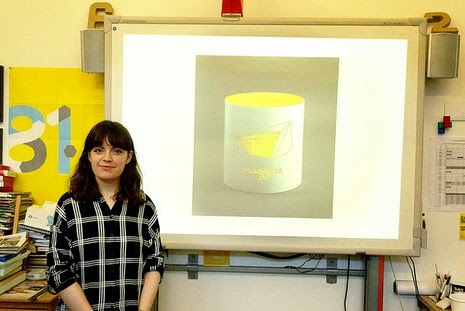 One of our HND Graphic Design students, Stephanie Dalzell, was named winner ina recent project the class did for cancer charity Maggie’s, to design a corporate gift to give to charity patrons. Stephanie's design was for a ceramic candle holder design, and featured a laser-cut image of the local Maggie’s centre. This project was instigated by stalwart mentor Graham Neish, who brought Maggie’s in meet the students and set a brief to imagine an object that would reflect the spirit of Maggie’s and which could be produced as a thank-you gift for patrons. The students visited Maggie’s Edinburgh so they could see for themselves how creativity in architecture and design play a vital role in making the centres calm and uplifting places. Maggie’s came up with a shortlist of five students, who all presented to the charity, and announced the winner at Granton Campus last Wednesday. More info on the project at the Edinburgh College website.